If you have suggestions for profiles, please send e-mail to car@agiweb.org. In April, James Dieterich of the U.S. Geological Survey (USGS) joined the ranks of a select group of USGS scientists who can count themselves among the members of the National Academy of Sciences (NAS). Dieterich's election on April 29 followed shortly after the election to the NAS Council of fellow USGS scientist Mary Lou Zoback, an NAS member since 1995. These two geophysicists, both from the Earthquake Hazards team in Menlo Park, are the only currently employed USGS scientists in the prestigious society of scholars in more than 15 years. Candidates for NAS membership are submitted without their knowledge and elected based on their scientific abilities. Dieterich learned of his new membership with a 6 a.m. telephone call. "It was a nice surprise," he says. 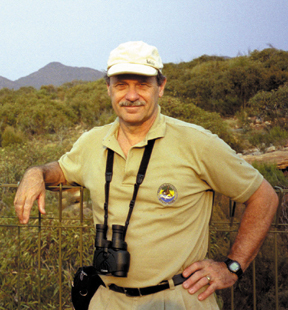 James Dieterich in Flinders Range, Australia. Photo courtesy of James Dieterich. "Jim has spent his entire professional career with the USGS in Menlo Park, having arrived as a postdoctoral fellow in the latter one-third of the previous century when the paint was still wet on the sign proclaiming the National Center for Earthquake Research," Ellsworth wrote. "Jim undertook the daunting problem of attempting to understand how rocks fail to make earthquakes through a series of simple and elegant experiments that led to his ground-breaking rate and state theory of friction. He single-handedly carried his ideas out of the lab and developed quantitative, predictive theories of seismicity which he applied to a host of problems in seismology and volcanology. I remember well his talk at the 1987 U.S.-Japan seminar on Earthquake Prediction in which he unveiled his seismicity equations. It took the rest of us the better part of the next decade just to catch up with where Jim was then, and we are still following in his footsteps." Indeed, Ellsworth especially is following the footsteps of Dieterich and Zoback as both have served as past chief scientists of the Earthquake Hazards team. "We've alternated between being each other's bosses," Dieterich says. Colleagues also look to the ideas Dieterich and Zoback created in their own fields as having a significant impact on the wider scientific community. "[They] have steered the direction of entire fields of work," says Michael L. Blanpied, Associate Chief Scientist for Science Programs on the Earthquake Hazards Team. "In Mary Lou's case this involved the state of stress in the Earth's crust and the sources of that stress, leading to the famous World Stress Map Project of the International Lithosphere Program back in the late 1980s and early 1990s. She became one of the NAS's youngest member on the basis of that work," Blanpied says. For her part, Zoback believes it is not a coincidence that of the six current or former USGS scientists with memberships in the NAS, now three  including emeritus scientist Art Lachenbruch, elected a member in 1975  are with the Earthquake Hazards team. "I think the earthquake program within the USGS is somewhat unique in that we've always had a very healthy balance between applied work  we run the nation's seismic monitoring system  and basic research," Zoback says. "We recognize that in the long term, it may take 20 years or more, but the advances we make are the result of our investment in basic research." 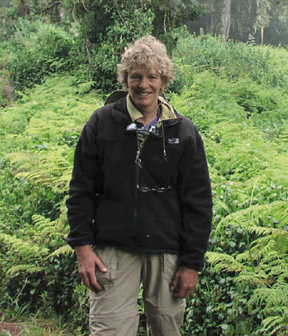 Mary Lou Zoback in the rainforest of Kilimanjaro. Photo courtesy of Mary Lou Zoback. She agreed to run for NAS Council, which acts as the governing board of the institution, in order to have a hand in the new initiatives and directions NAS is moving into in the next few years, she says. "Bruce Alberts, who has been president of the academy for the last 10 years, has made a conscious effort to extend our research and influence globally and help other national academies around the world increase their influence and visibility particularly in terms of providing advice to their governments," Zoback adds. She was particularly impressed with the relationships NAS is establishing with African academies and a joint report NAS put out recently with China on the use of personal cars in that country. "Those are the kinds of activities that I'm very supportive of our academy doing and by serving on the council I hope to help promote more of that in the future." 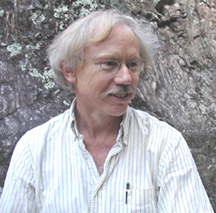 University of Berkeley geomorphologist Bill Dietrich was also one of the 72 new members elected to join NAS on April 29. He says his last name is the correct spelling: "Mine is spelled the right way, like Marlene Dietrich," he says with a smile, contrasting his last name with that of fellow Bay Area geoscientist inductee Jim Dieterich. Bill Dietrich and his research group have contributed to development of quantitative expressions for predicting the production and transport of soil and the erosion of river valleys. They have used cosmogenic nuclide measurements and airborne laser mapping to obtain new insights about landscape form and process. He has contributed to problems ranging from floodplain formation rates in Papua New Guinea, to controls on landslide occurrence in the Pacific Northwest. Dieterich, James H.; senior research scientist, Earthquake Hazards Team, U.S. Geological Survey, Menlo Park, Calif.
Dietrich, William E.; professor, department of earth and planetary sciences, University of California, Berkeley. Fisk, Lennard A.; professor and chair, department of atmospheric, oceanic, and space sciences, University of Michigan, Ann Arbor. Kulkarni, Shrinivas R.; McArthur Professor of Astronomy and Planetary Sciences, California Institute of Technology, Pasadena. Lean, Judith L.; research physicist, space science division, Naval Research Laboratory, Washington, D.C.
Melosh, Henry J.; professor, Lunar and Planetary Laboratory, University of Arizona, Tucson. Schlesinger, William H.; James B. Duke Professor of Biogeochemistry and dean, Nicholas School of the Environment and Earth Sciences, Duke University. Chisholm, Sallie W.; Lee and Geraldine Martin Professor of Environmental Studies, and co-director, Earth System Initiative, Massachusetts Institute of Technology, Cambridge. Deming, Jody W.; professor of biological oceanography, University of Washington, Seattle. Held, Isaac M.; senior research scientist, and head, Climate Dynamics Group, National Oceanic and Atmospheric Administration, Princeton, N.J. Miles, Edward L.; Virginia and Prentice Bloedel Professor of Marine and Public Affairs, University of Washington, Seattle. For a complete listing of the 72 new members elected visit the NAS Web site.